We all know the importance and danger of summer sun exposure, but do we know how to maximize our diet for the best results? There are several simple rules to keeping a clean and clear complexion over the summer, even while getting that summer bronze that we all want. Our skin is actually our largest organ on/in the body. It is made up of several layers that are constantly changing and need proper nourishment just like the rest of our body. As we age, the ability to replace dead skin and collagen fibers slows, which can contribute to wrinkles. 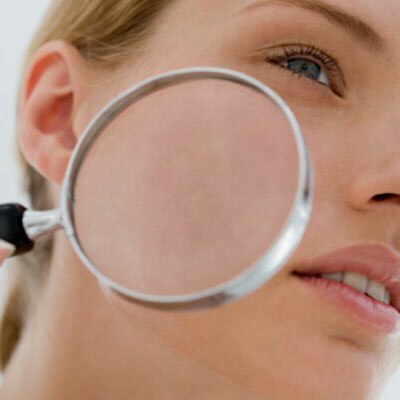 Also, with the increase in temperatures, the skin may become more oily, making us more prone to acne breakouts. The most important nutrient for healthy skin (and body) is WATER! Over the summer you will sweat more and this can lead to the skin drying out, which in turn can lead to more oil production and pimples. Staying hydrated will keep the skin “plump and rosy” while minimizing wrinkles and lines. You should aim to drink close to gallon of water every day, and more if you are exercising at high intensities. The next nutrient is Vitamin C. It is the most abundant water-soluble antioxidant and plays a huge role in forming new collagen to keep the skin firm. High sources of Vitamin C include, citrus fruits, berries, tomatoes, red pepper, and broccoli. Vitamin E is the most abundant fat soluble antioxidant and will strengthen and protect the lower layers of the skin. Try eating whole grains such as whole wheat, wheat germ, barley, sunflower oil, and almonds. Vitamin D is naturally produced in the body when exposed to sunlight. Wearing sunscreen is important to prevent aging but it also blocks out the UV rays needed to produce Vitamin D. Try being in the sun for 10 to 15 minutes before applying sunblock. Dairy and mushrooms are good sources of Vitamin D, but it can also be regularly supplemented at levels of 2000 IU without any negative side effects. If you’re not getting enough vitamin A in your diet, then your skin is majorly suffering. Not enough of this nutrient makes skin dry and flaky. The vitamin is also touted for its anti-aging benefits. Load up on red peppers, spinach, and kale. Zinc is a very important mineral when it comes to healing of the skin. 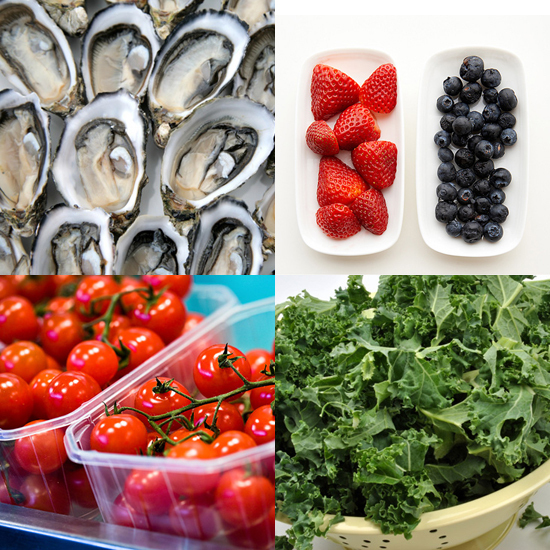 Shellfish and beef are great sources of zinc and will help your skin heal from potential scrapes and burns. Iron is also important for the blood to help carry essential nutrients to all organs including the skin. Women of child bearing age who avoid red meat should consider a women’s one-a-day vitamin to meet their daily requirement of 18mg. Lastly, healthy fats such as Omega-3 oils are very helpful to keep the skin healthy and glowing. Avocados, flax seeds, salmon, and walnuts are all great sources of healthy fats. They are also known to suppress inflammation and can help reduce acne breakouts. Diets high in sugars and low in zinc will lead to more inflammation thus increasing the chances for breakouts. When it comes to exercise, increased muscle tone can help tighten up the skin, keeping it looking smooth and youthful. All exercise will increase blood flow, which increases the delivery of essential skin-healthy nutrients to the body and also shuttling away toxins that may harm the complexion. Using sunscreen is a must to protect the skin and also showering right after exercise will help wash away the sweaty oils on your skin, but the diet can play just as big of a role in how you look during the hot months of the year. This entry was posted in Nutrition and tagged Exercise Blog, fish oil, health, skin, summer skin, vitamins, wellness by Mike Gorski. Bookmark the permalink.